Yesterday's reading in Exodus 17 gave me one of many "aha" moments I've experienced since my Blogging Through the Bible journey began last year in August. One of my Sunday School teachers years ago used to comment on the "gold nuggets" he would find during his study time in the Word of God. I discovered my own "gold nugget" yesterday, and it is something that I cannot stop thinking about. Can I share it with you today and let's examine our hearts together with God's Word? We can be in the will of God for our lives and still experience troubles. "The whole Israelite community set out from the Desert of Sin, traveling from place to place as the LORD commanded. They camped at Rephidim, but there was no water for the people to drink." Did you catch that? The Israelites were in the place the Lord had commanded for them to go, but trouble was waiting for them there. But there wasn't only trouble waiting for them. A miracle of God was waiting for them there as well. An opportunity for God to show His glory. Another chance for God to extend His love and grace against a murmuring people who were quick to turn to pointing fingers of blame when they should have been turning to God for their present need. Do you find yourself today questioning where God has brought you? How are you handling the trouble or need that is present in the place where God has commanded you to go? I hope it is only by prayer to the One who can supply all your needs according to His riches in glory by Christ Jesus (Philippians 4:19). 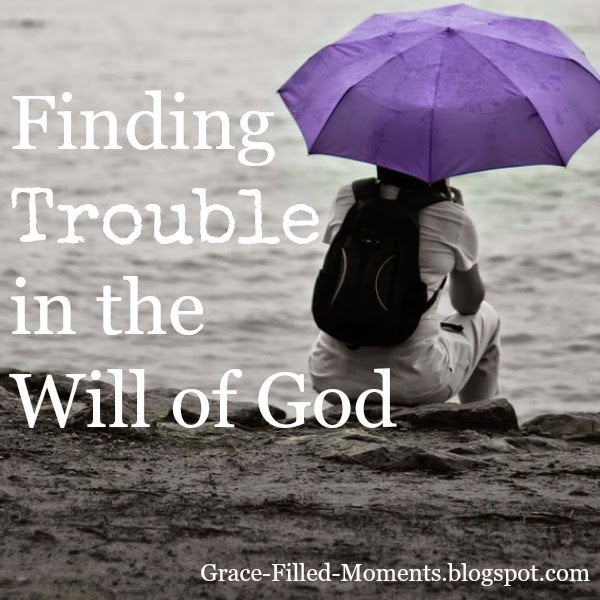 Walking in the will of God is not without its troubles my friend. God has called me to homeschool our son, so that means we are a one-income family. Financial struggles are an on-going thorn in our flesh. BUT GOD has been faithful to meet all our NEEDS according to His riches in glory by Christ Jesus. As my husband and I have put God first in the giving of our tithes, talents, and time - He has been faithful over and over again to provide. My prayer for you today is that you find hope in God and in His Word for your present circumstances. If you are experiencing your own troubles as you seek to walk in the will of God, please let me pray for you - you don't have to leave any details - just comment below "I would like you to pray for me. ", and I promise to add you to my prayer list. Observations: The Israelites were traveling from place to place as the Lord commanded. They were in the will of God when this need arrived. Instead of remembering the mighty acts of God that He had performed on their behalf in the past and asking Him to fill this current need in their life, they choose instead to complain about their current lack of water and blame Moses once again. Application: We can be in the will of God and still go through difficult times. James 1:2-4 tells us “Consider it pure joy, my brothers and sisters, whenever you face trials of many kinds, because you know that the testing of your faith produces perseverance. Let perseverance finish its work so that you may be mature and complete, not lacking anything.” God desires to mature us and make us complete in Him through the trials of this life. When we look to people to fulfill needs in our lives that only God can truly fulfill we set up our relationships to fail. We must first look to God our Creator to fulfill the desires of our hearts and the needs of our lives. Kneel: Heavenly Father, I remember the words of Jesus this morning where He tells us to take heart during the troubles we go through in this world because He has overcome the world. His words are meant to bring us peace in the midst of our troubles that are sure to come even as we walk in this world according to Your will. Help us to look first to You Father for the needs we have in this life. You have told us in Your Word that if we seek Your kingdom and Your righteousness everything else that we need will be provided by Your loving hand. Help us not to complain when we find ourselves in troubling times. Let us look instead for how You are going to move miraculously once again on our behalf as You’ve done so many times before in our past. In the powerful and mighty name of Jesus I pray. Amen! Observations: Moses received wise counsel from his father-in-law, Jethro, in how to handle a job that was too big for him to try to handle alone. Jethro gives him 4 steps in effective delegating so that Moses can use his time and energy more wisely as a leader. These same steps can be beneficial to us today. 1. Stand before God for the people. The first step in effective delegation is spending time in prayer before God for the people. His efforts of delegation would not work if God was not involved in it. 2. Teach them the statutes and the laws. Moses had to teach not only the people who would help him in hearing the disputes, but he would also need to teach those who were involved in the disputes. Teaching everyone the statutes and the laws would not only help the people know God for themselves, but it could possibly end disputes before they even would need to come before Moses’ chosen helpers. 3. Select from all the people able men, such as fear God, men of truth, hating covetousness. Moses efforts of effective delegation would fail unless put into the hands of men who were able, feared God, were truthful and did not covet. 4. Every great matter they shall bring to you. To be an effective leader who delegates, Moses must realize that he is not to abandon his ultimate responsibility in oversight and leadership of the men he places in positions underneath him to help him. Great matters were to be brought to him to decide. We are not meant to bear the burdens of ministry - or of this life - alone. Effective delegation will help us to be able to enjoy life and do better what God has called us to do. Also, when we delegate using these guidelines, those around us will live a much more peaceful life because their needs will be effectively ministered to. Application: It is important to have friends who walk closely with God and can give me wise counsel. It is important for me to be that friend who walks closely with God and can give wise counsel from those who seek me out for guidance in their lives. If I delegate tasks in my life and ministry, then I need to follow these steps in deciding who to ask for help. Asking for help is not a sign of weakness, but shows how much I value the lives of those God has entrusted to me in my life and in whatever my ministry may be. Kneel: Heavenly Father, I see in Your Word this morning the importance of walking closely with You so that I can know Your truth and plant it deep within my heart. I want to be able to help others who are in need of counsel for their lives. Should someone decide to come to me for counsel, I want to be so filled with Your Word that I can speak hope and peace into their lives as Your grace moves through me. I thank You, Father, for the wise, godly women You have placed in my life that I can go to for counsel and prayer. I pray that You would bless them and meet every need in their lives. I pray that You would guide me with these steps of effective delegation when necessary in my own life. Help me to recognize when pride is holding me back from asking for help in my own life and ministry that You have blessed me with. In the mighty name of Jesus I pray. Amen! 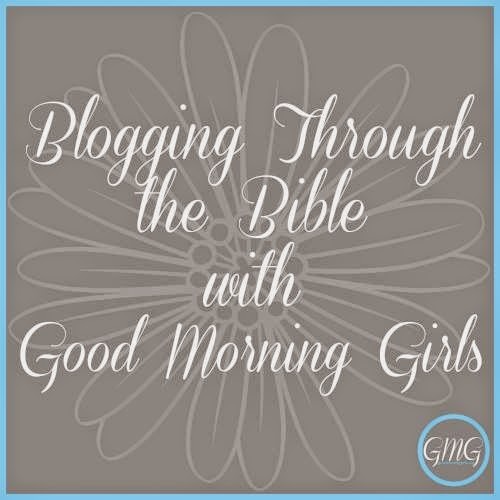 I'll see you back here on Friday for another Blogging Through the Bible post. Until then, keep walking in His grace! I used to wonder about all of the grumbling in the dessert, but I finally realized I probably would have been a willing participant. It's all about where I keep my focus. Praying to simply trust and obey. Thanks so much for linking up at CMB. Blessings to you! Oh, I know what you mean Deb. And yes, it is all about were we keep our eyes focused. It's not an easy lesson to learn by any means, but when we learn to keep our eyes on Jesus in the midst of the storms of this life - we can have that peace that surpasses all understanding while the waves rage around us. Praying your pray for my life too. Thanks for hosting the link-up on your blog. I'm going to create a Link-up Party page here and will include your blog with the other blogs I link-up with. Blessing to you as well!